A 6 year old girl was hospitalized weighing only 18 pounds. She was unresponsive at the time. 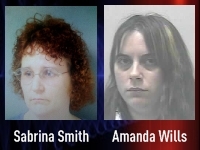 She had been systematically starved by her mother, Sabrina Smith, 41, and her guardian, Amanda Wills, 30. While she was initially in critical condition, the girl ultimately recovered. In addition to being severely malnourished, her body was covered with bruises and other injuries. Smith and Wills admitted to restraining the child with zip ties in a car seat for long periods of time. Smith said she homeschooled the girl. The girl had five siblings, age 13 to 5, but was apparently singled out for abuse. The mother denied abuse, claiming the child had a medical condition, but detectives said this was the most severe case of abuse they had seen in 20 years. The girl and her five siblings were taken into protective custody.